One food I used to eat all the time before I became more aware of nutritional values and health was the spinach and artichoke dip from TGI Fridays. Yes, good ol’ Friday’s. This spinach and artichoke hummus is excellent atop Portobello mushrooms, as in this recipe, as well as a great dip for pita or tortilla chips. Marinate the Portobello mushroom caps in the marinade mixture for one hour. Preheat oven to 350°. Chop spinach and artichokes. Heat 2 tbsp oil in a medium skillet on medium/high heat. Add 2 tbsp fresh minced garlic one oil is hot. Sautee garlic until it starts to slightly brown. Add the chopped artichoke hearts and brown well, about 10 minutes, stirring often. Add baby spinach leaves and pimento peppers. Sautee until spinach is fully wilted. Once spinach is wilted, remove and let cool about 5 minutes. In a large mixing bowl, add the plain hummus, nutritional yeast, garlic powder, rosemary, Italian seasoning, wheat gluten (or flax meal), GoVeggie! vegan cheese, followed by the artichoke and spinach. Mix well. 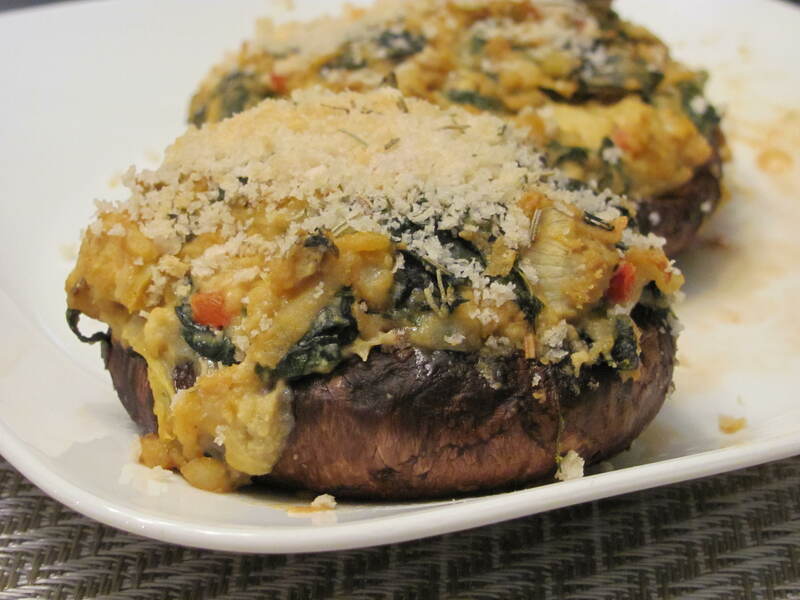 Gill-side up, fill each Portobello mushroom cap with a heap of the hummus mixture. Top with panko breadcrumbs (about 1 tbsp each) followed by an additional sprinkling of rosemary. Bake in a glass Pyrex-type baking dish for 30 minutes or until mushrooms are fully softened and breadcrumbs are browned. Serves 4.